3 Years legal expense cover FREE! Part Exchange VERY Welcome, 2 YEARS WARRANTY -The Stunning RKF 125 Is Miles Ahead Other 125cc Bikes! The Quality Finish, The Stylish Lines & The Punchy Engine Make This Bike Stand Out! Easily As Good As Any Of The Other Machines That Are Twice The Price - So It Simply Cant Be Matched For Value & Quality! This is a brand new bike with 2 years manufacturers warranty. We are an authorised Keeway dealer stocking new bikes. (See our other Keeway models) -Price excludes DVLA, RFL & Manufacturers Delivery. 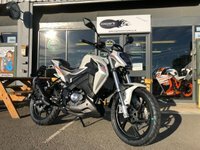 OTR Price is £2699 Typical finance example, £499 DEPOSIT 36 X £70.45 HP APR 9.9 % Total amount payable£3,035.20 Finance available STS, Terms & Conditions Apply, All Finance Is For Over 18's Only. Buy 24/7 by TEXT ON 07970 777639 At Cooperb Motorcycles we like to offer the friendly personal service that only a family run dealership can offer. We listen well, try our hardest to help & ONLY offer the highest quality bikes we can find.